We moved into our house just before Christmas so we decided to leave hiring an architect until we'd finished our Christmas celebrations. Here's what happened and the lessons we learned along the way. 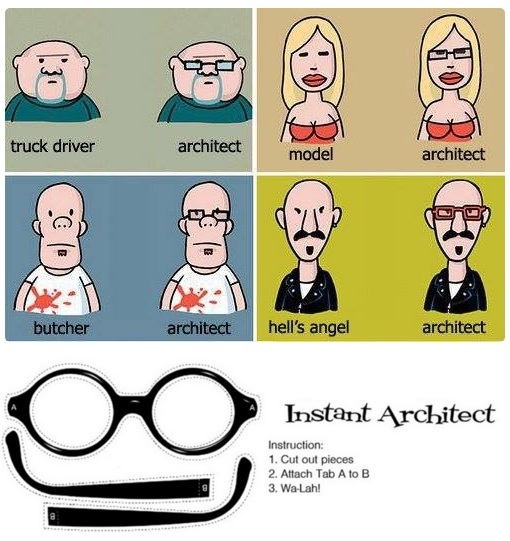 What is it with architects and glasses? So, where did we start? As with anything I try to do in life, if I'm not sure, I ask my friends. After a few days I had names of three architects passed on to me so we arranged to meet each of them. First in was a friend of mine who is an architect with a flourishing award winning partnership, ODOS Architects. He sent along his partner so that we could keep friendship and business separate. Their style is really cool futuristic buildings and as the consultation progressed it dawned on me that their design taste clashed with what we wanted for our house. We didn't want a modern glass box of an addition, we wanted to add something that would look like it had always been there. I called my friend a few days later and we had a 'no hard feelings' chat and we left it there. Hire an architect whose design philosophy and taste matches with what you want for your home. Most architects are probably capable of designing to different styles but you'll get the best results if your architect is designing in the style they enjoy and have the most experience in. Next was a firm that specialises in extensions, Extend. Their portfolio had a range of styles and they had a few different service levels you could choose from and seemed to have a well oiled process with different packages you could choose from: architectural services only, architectural services plus structural engineer, architectural services, engineer and quantity surveyor, numerous levels of involvement of a project manager. It all seemed very well thought out. At first I was impressed and liked the idea of the systematic approach, but when I thought more carefully I became concerned. Our home presented so many possibilities (what a lucky position to be in) that I felt we would never come to a satisfactory design without quite a bit of tooing and froing between ourselves and our architect. During the presentation the representative of the firm said that design was typically signed off after two or three iterations. I thought I'd need more than that. Ask each of the architects you are considering about their process so that you know what to expect. Make sure it's in line with what you need. Also ask about other professionals (structural engineers, quantity surveyors, contractors, project managers, interior architects) that they have worked with in the past. Last but not least was a sole practioner called Andre who was recommended by some friends. His practice is called Studio Negri. They were just finished a complete remodel which included a large extension so really they’d just finished what we were just starting. We liked how their house had turned out so we gave Andre a call and arranged to meet for a chat. Andre's approach was different to the other architects. When he arrived he wanted to look around the house rather than sit down straight away. And once we did sit down rather than launch into his portfolio he started sketching out ideas for our project. We liked his ideas and you've probably guessed by now that we hired him. When you're interviewing architects, ask them to sketch out a few of their ideas. That way you'll get a chance to see how they think and how they react to your feedback. You may want an architect who will take control, or you may want someone who will work with you and take your ideas into account. Getting them to draw for you on the first meeting gives you a chance to see what working on the design will be like and may give you a few ideas that you hadn't thought of.